Starbucks is raising a Mocha or a Latte or a Caramel Macchiatto or a Flat White … you decide! … to celebrate its customers at the end of the year with 10 Days of Cheer. Starting Dec. 23, 2016, to Jan. 2, 2017, select Starbucks stores across the United States will host “Cheer Parties” where customers can enjoy FREE Tall handcrafted espresso beverages from 1:00 – 2:00 PM local time. That’s a free drink! No purchase necessary! The Cheer Parties will pop up at 100 Starbucks stores across the United States from 1-2 pm local time, over 10 days. In the greater Seattle area, the Cheer Parties will be held at more than 15 Starbucks stores from Dec. 23 through Jan. 2. (There will be no Cheer Parties on December 25th). The locations of the Cheer Parties will change every day. You can find a Cheer Party near you by visiting Starbucks starbucks.com/cheer daily. The website lets you sort by state to find the locations giving away the free Tall handcrafted espresso beverages. Examples of Tall handcrafted beverages includes things like a Tall Holiday Spice Flat White, a Tall Latte, a Tall Caramel Macchiato, a Tall Gingerbread Latte, a Tall Skinny Vanilla Latte, a Tall Mocha, Tall Cappuccino and much more! You can order the iced version of the drink so long as it’s the Tall size and it’s a handcrafted espresso beverage. Also, you can also visit your favorite participating Starbucks store in the U.S to celebrate 10 Days of Cheer by receiving a Cheer Card with a special offer, while supplies last. The offers include 50% off a Spiced Sweet Cream Cold Brew or Holiday Spice Flat White beverage, or 50% off any lunch item (sandwiches, salads, bistro boxes), or a free holiday cookie or Cranberry Bliss Bar with the purchase of a handcrafted beverage (any size). 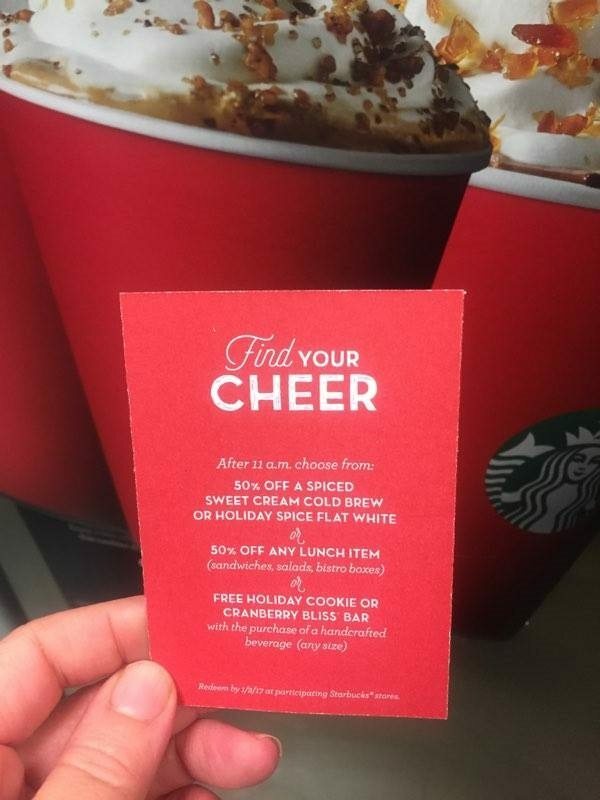 The Cheer Cards will be handed out at company-operated Starbucks stores in the U.S. everyday starting Dec. 23, 2016 to Jan. 2, 2017. Keep in mind that “participating” locations in the United States is almost entirely going to mean company-operated stores. Locations inside another business (like a Safeway or Target Starbucks) are almost never “participating” locations for this kind of event. Company-operated Starbucks stores are almost never inside another business such as Safeway, Barnes & Noble, hotels, airports, for example. You should use the starbucks.com/cheer website to find the stores offering free drinks. Enjoy! I hope you get a free drink! Seattle Starbucks news: We Love You Fridays. Free tickets to the Woodland Park Zoo and more. the site shows places by states…but this card you’re holding is something different and there is no freebe on that card (i got one also from the local starbucks but it’s not one listed on the free “10 days of cheer” website. Starbucks website is always leaving much to be desired. What time are the cheer cards distributed? Is it the same time as the “Cheer Party,” or is it all day? Thanks so much for the info! I really had no idea what was going on. There probably won’t be a Cheer Party near me and I’m not going to drive to Cleveland for a tall, but I’m pretty excited about those cheer cards! Free peppermint mocha today at Grapevine sbux (DFW area). Line in the drive in wasn’t even all that long!! YAY! Thanks Starbucks! I was lucky to be able to visit three different Pop-Up Cheer Parties in the Chicago suburbs, and they were all fantastic experiences! Each store was ready for the rush, and everything went so smoothly. We were greeted in line by a local manager who asked if we had any questions. There was another manager at the pick-up bar calling out names and making sure everything was orderly. Everyone was cheerful! I spent some time talking to one of the managers, who explained that most of the people working that day were managers from other stores. Since they were free, I tried drinks I had never ordered before. I hope Starbucks does this again next year!